If you read personal finance blogs, I’m sure you’ve heard of Shopping Bans before. The “rules” of a shopping ban are simple – don’t buy anything other than the necessities for a specific amount of time. Instead, use the items you already have, borrow them, or simply go without. The goal is of course to spend less and save more money, but the benefits are greater than just that. It can change the way you think about money and the need to buy things. It can help you break any negative spending habits you have by making you aware of what your spending triggers are. You can learn to be more appreciative of what you already have and become a more conscious consumer. I was forced into a shopping ban after being laid off and unable to find a full-time job for over 2 years. I simply could not afford to buy things. Even when they were things that I actually needed. I was jealous of everyone who chose to go on a shopping ban. They were doing it to make things better for themselves, while things were getting worse for me. Regardless, I was recently reminded of how I benefited from this experience more than I ever could have imagined I would. 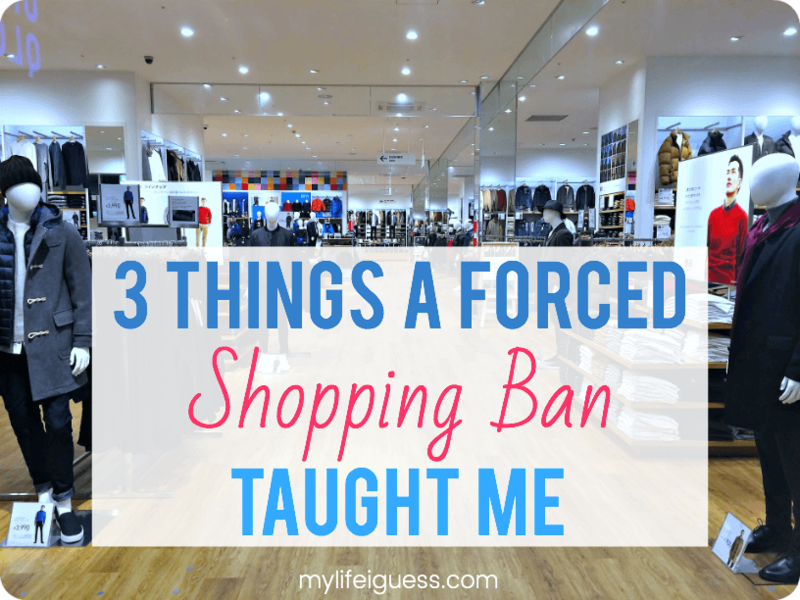 The lessons I learned from my shopping ban have stayed with me. In fact, I’m still learning more from it every single day. I already have too much stuff. When my now-husband and I first moved into a 3-bedroom townhouse together, we each claimed a spare bedroom. I used my room as a home office and he used his room as a music studio. But storage space in our place is seriously lacking. Before long, we had to shuffle everything around. We moved our bedroom into his music studio, use the master bedroom as a joint office/music space, and my old office has become a storage room. And guess what? We almost never go in the storage room. There are boxes in there that have never been unpacked from when we first moved in over 3 years ago. There have been a few times where we needed something that we just so happened to have in storage, but for the most part, this hasn’t been the case. And it’s never been anything worth more than a few dollars. Our storage room causes me a lot of stress. A lot more than those few dollars we didn’t have to spend are worth. So why would I want to go out and buy even more stuff? I need to assess what I already have and either get rid of it or start using it. Not being able to buy new things makes you a lot more resourceful. Recently, I was reminded of this whole shopping ban thing when my relatively new windshield wiper broke off. While I was driving. On the highway. In the middle of an ice storm. I honestly though I’d have to pull over, call CAA and hope that I wasn’t going to have to wait hours for them to show up. Thankfully that wasn’t the case. My husband truly MacGyvered the windshield wiper back together (in every sense of the word) in a parking lot using my hair elastic and two bobby-pins. Not only did we get home safely thanks to his quick-fix, but it’s still holding on just as strong as before. And I’ve continued to fix things whenever I can, even when I can afford to replace it. After years of pinching pennies and being banned from shopping, I would have thought I’d blow at least one of my first pay cheques buying all the things I couldn’t afford when I was unemployed. I had been keeping a wish list, after all. I’ve never been a big shopper, but I used to go shopping a lot. I lived alone and I’d use it as a reason to get out of the house. And I would end up buying things that I didn’t really want or need. I no longer feel banned from shopping, but I do feel burdened by it. It’s something I avoid to the point where sometimes, I’d rather go without than go shopping. Although I was forced into my shopping ban, I’m grateful that it happened. 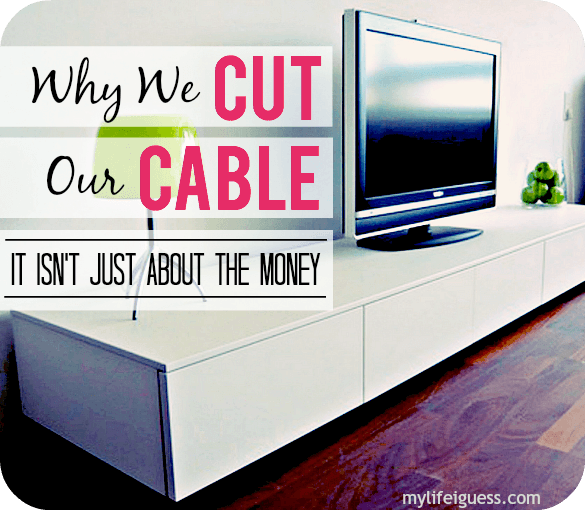 My relationship with money and things have changed dramatically because of it. Paying down my debt and filling up my savings account is far more important to me than having shiny new things. I know I can survive just fine without more stuff. YOUR TURN: Have you tried going on a shopping ban before? If so, what did you learn from it? If not, what’s stopping you? I agree–we have so much junk in my house that I would love to sell–it’s just having the energy to sell it (it takes time to take photos, upload them, write up a synopsis, and hope for bites!) That’s why I’ve just gotten into giving stuff away, sometimes the paltry profits aren’t worth the time entailed. One thing I actually hate collecting is books (and movies). Don’t get me wrong, I LOVE reading, but I find no point to having a wall full of books when I’m part of a great county library system where I can practically get any book I want. I’m not a big re-reader except for on certain books (and I’ll always keep those). But my husband refuses to part with them, so along with a collection of movies we never watch, our shelf of intellectual property items just sits there, gathering dust, and becoming a target for our toddler to pull of the shelf and damage. And I’ll tell you, after coming out of graduate library school with a focus in archives, I learned that none of those toys, books, comics, etc. will be worth anything in a person or their child’s lifetime and beyond. Bibles from the 19th century are still worthless today because they were mass produced at the time. So if someone ever worries that they gotta keep something because it’ll be worth something in a few years, more than likely it probably won’t. Unless it’s a guaranteed signed copy or some nice piece of art, you’re better getting rid of the junk. :) Even a CD that might be worth something now because it was out of production, more than likely they’ll be reproduced and worthless again so you might as well sell now to enjoy the profit. (Nine Inch Nail’s Pretty Hate Machine is a perfect example–it was OOP but now is back in production and cheap to obtain). Yes, vinyl is a very different ball game, so I will say some of those collections are worth keeping. I love watching Antiques Roadshow look-back episodes and seeing stuff that was high in value at the time drop dramatically. Hopefully those poor people sold while they had the opportunity to make a buck! Every day I’m amazed at how much stuff we’ve accumulated, some of which I know we’ll never use again. I have started ever so slowly to start either selling, donating, or throwing some of it away. Part of the issue we have is that it often feels like even dedicating a whole lot of time won’t even make a dent in the process, so you end up doing something else. Having too much stuff is super stressful! Not that I would call myself a minimalist but I appreciate the benefits of having less stuff. It’s less to maintain. Less to care for. Less expense (and more savings!). Less house to store it all. We live in a 1,000 sqft bungalow with 4 of us (two small children) and we love the fact that our limited space makes us very conscious of how much we buy. Purchases must be very deliberate because if something comes in that usually means something else has to go. Too much stuff is stressful!! I’ve done shopping bans before because I couldn’t really afford extras or because I was just over spending $ and wanted to pad my savings account. I’m about to do one now because I went a little crazy in March/April. I’m always okay with buying things I truly need (as long as finances allow it) but I am totally over STUFF and spending just to spend so I try to be much more aware of that. Omg! A year without shopping? That is so impressive. I’ve been looking at the purchases I’ve made in the past year, and I know for a fact I could’ve gone without most of it. This sounds so interesting!